India's Modi Makes A Name For Himself — Literally — In Meeting With Obama : The Two-Way The Indian prime minister wore a suit with pinstripes that read "Narendra Damodardas Modi." 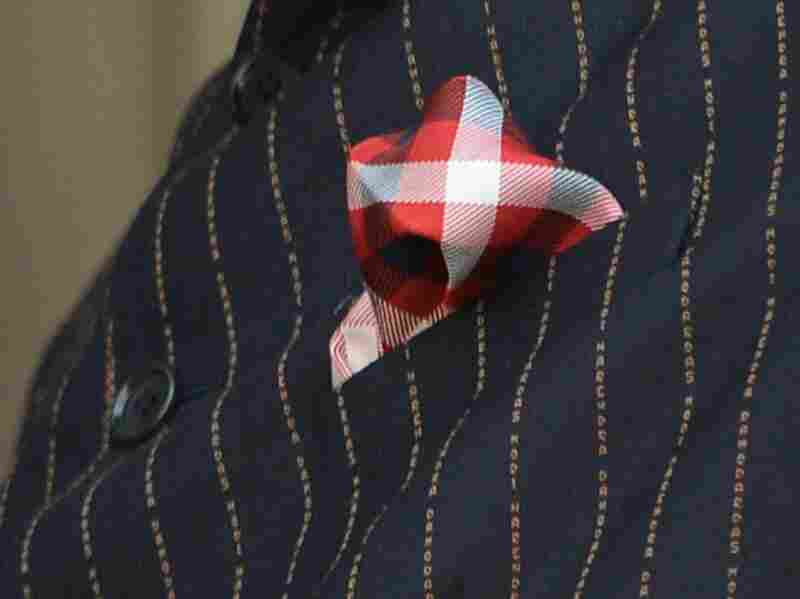 The reaction on social media was scathing, but Modi is often lauded for his fashion choices. An up-close shot of Indian Prime Minister Narendra Modi's suit reveals its telltale lettering: his name, in stripes of gold down his jacket. There are many ways in diplomacy to make a name for yourself. Indian Prime Minister Narendra Modi seems to have taken this message literally. Modi's meeting with President Obama on Sunday dominated the headlines for what the U.S. president called a "breakthrough understanding" on a civilian nuclear agreement signed in 2008. But the attention Monday, when Obama attended India's Republic Day parade with Modi, was on what the Indian leader wore during Sunday's meeting. The pinstripes on the suit, in case you can't see it clearly, read "Narendra Damodardas Modi." The reaction on social media was scathing. I am seriously interested in knowing who's the Joke who made this Narendra Modi Suit. Narendra Modi wore a suit with his name printed all over it. Some even pointed out that the personalized suit was made famous by ousted Egyptian President Hosni Mubarak. Modi, we should point out here, is often lauded for his fashion choices — something this blogger seldom, if ever, is. On Sunday, Modi began by greeting Obama at the airport in a cream-colored kurta and orange shawl. At a later meeting, Modi had changed into his now-famous pinstriped suit. That evening, at a banquet in Obama's honor at the presidential palace, Modi donned a gray Indian jacket. Designers interviewed by India Today, a newsmagazine, praised Modi's choice, which was tailored by Jade Blue in Ahmedabad in the prime minister's home state of Gujarat. One designer said the pinstriped suit could have cost up to $8,100.